As you may recall, you were in contact with CARA a couple of years ago about the possibility of including questions about the Traditional Latin Mass in one of our surveys. I just wanted to let you know that we were able to include questions very similar to those you were interested in in a poll we conducted in 2008 and have just released the results. The press release is posted on our website at http://cara.georgetown.edu/pr082409.pdf. The findings suggest that fewer Catholics have an opinion about the Mass than was the case when the Gallup poll asked about it in 1985. I suspect that this is largely a function of many fewer Catholics having any recollection or experience of the Traditional Latin Mass than was the case in 1985. — Sr. Mary E. Bendyna, RSM, Ph.D.
CARMEL, INDIANA – The St John Bosco Traditional Latin Mass Community will have a change of venue for the TLM. The location for the community’s TLM on August 30th and for all Sundays in September will be at Our Lady of Mount Carmel Roman Catholic Church, Carmel, Indiana. The Mass will begin at 3:00 PM. This TLM for the St. John Bosco Latin Mass Community has been in existence since April 2008. ROME The document was delivered to the hands of Benedict XVI in the morning of last April 4 by Spanish Cardinal Antonio Cañizares Llovera, Prefect of the Congregation for Divine Worship. It is the result of a reserved vote, which took place on March 12, in the course of a “plenary” session of the dicastery responsible for the liturgy, and it represents the first concrete step towards that “reform of the reform” often desired by Pope Ratzinger. The Cardinals and Bishops members of the Congregation voted almost unanimously in favor of a greater sacrality of the rite, of the recovery of the sense of eucharistic worship, of the recovery of the Latin language in the celebration, and of the remaking of the introductory parts of the Missal in order to put a stop to abuses, wild experimentations, and inappropriate creativity. They have also declared themselves favorable to reaffirm that the usual way of receiving Communion according to the norms is not on the hand, but in the mouth. There is, it is true, and indult which, on request of the [local] episcopates, allows for the distribution of the host [sic] also on the palm of the hand, but this must remain an extraordinary fact. The “Liturgy Minister” of Pope Ratzinger, Cañizares, is also having studies made on the possibility to recover the orientation towards the Orient of the celebrant, at least at the moment of the eucharistic consecration, as it happened in practice before the reform, when both the faithful and the priest faced towards the Cross and the priest therefore turned his back to the assembly. For this reason, the “propositiones” voted by the Cardinals and Bishops at the March plenary foresee a return to the sense of sacredness and to adoration, but also a recovery of the celebrations in Latin in the dioceses, at least in the main solemnities, as well as the publication of bilingual Missals – a request made at his time by Paul VI – with the Latin text first. 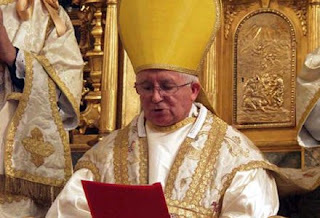 The proposals of the Congregation, which Cañizares delivered to the Pope, obtaining his approval, are perfectly in line with the idea often expressed by Joseph Ratzinger when he was still a Cardinal, as it is made clear his unpublished words on the liturgy, revealed in advanced by Il Giornale yesterday, and which will be published in the book Davanti al Protagonista (Cantagalli [publisher]), presented beforehand at a congress at Rimini. With a significant nota bene: for the accomplishment of the “reform of the reform”, many years will be necessary. The Pope is convinced that hasty steps, as well as to simply drop directives from above, serve no good, with the risk that they may later remain a dead letter. The style of Ratzinger is that of comparison and, above all, of example. As the fact that, for more than a year, whoever approaches the Pope for Communion, have had to kneel down on the kneeler especially placed by the cerimonieri. The liturgical reform of the 1970-ies is today taking up much space in the theological discussions, because liturgy and theology are mixed up in a – may we venture to say so – “transcendental relation”. It is not possible to discuss the one without taking up the other, if one does not want to fall into that theology of watertight compartments that was in use in the 1950-ies. Today it is necessary – in the wake of a more vast debate in which we engage ourselves – to formulate an open and straightforward analysis of what has happened and take an appropriate attitude towards the practical remedies and above all remedies that are “realizable” (realizzabili) as Saint Pius X used to repeat. Upon the request of so many of our readers, our Editorial Office also would like to occupy itself with the argument, if possible avoiding the repetition of the methodological errors of the past. Therefore it is our wish to initiate the true transmittance of the authentic Tradition.– basing ourselves on the testimony of those who have known the past, because of their age and their prestige, and not only because of their authority. As liturgy is also practical science, we have not wished to start off with pontificating “liturgists” who say they have read so and so many books and codices, but rather take the matter up with someone who has lived and touched the liturgy as nobody else has, because he has prepared, repeated, coordinated and known the religious ceremonies in his Tuscan countryside, ceremonies which concluded with the “Messa in terza” (a mass celebrated by three i.e. Solemn Mass — CAP) and the unfailing processions with a musical band, as well as the splendors of the “Cappella Papale” in the Sistine chapel. We have the honor of introducing to you Monsignor Domenico Bartolucci, in an interview done by us lately. He was born in 1917 in Borgo San Lorenzo (Florence)., Tuscan by birth, Roman by pontifical summons, in 1952 he became substitute next to Perosi in the Sistine Chapel and from 1956 he became its Maestro Perpetuo. On the 24th of June, 2006 the reigning pontiff organized a special ceremony in honor of the musician (see the picture above), in order to consecrate “ad perpetuam rei memoriam” his closeness to the great master. During the occasion the Pope said: “ sacred polyphony, especially the one belonging to the Roman school, is a legacy which we must preserve with care (..); a genuine updating of the sacred music can only take place within the great tradition of the past of the Gregorian chant and of the sacred polyphony”. S.C. It means that they need it! I am speaking of the structure that the wisdom of the Church had so delicately chiseled in course of centuries. You do not understand the importance of the seminary: a liturgy that is fully lived, the orderly articulation of the different periods of the year and all this experienced in social communion with the brothers… Advent, Lent, the big feasts that follow after Easter. All of this is educational and if you only knew how much! Let us for instance take the innovations in the seventies. Some ugly songs in beat that were in vogue in the churches in 1968, are today already archeological pieces. Giving up perennity and emerging oneself in time, means that one is condemned to the fads of fashion. In this connection I come to think of the Reform of the Holy Week in the 1950’s, made with some hurry under the pontificate of a Pope Pius XII who was already exhausted and tired. Only some years later, under Pope John XXIII who in liturgical matters was of a convinced and moving traditionalism, came a telephone call to me from Mons. Dante, Master of Ceremonies of the Pope, who told me to prepare the “Vexilla Regis” for the coming celebration on Good Friday. I was somehow taken aback and answered: “They have forbidden me to do it”. The answer was: “But the Pope wishes it.” In a few hours I organized the repetitions of the songs and very happily we sang again the same songs which the Church had sung in many centuries on that day. All this only to say that when one distances oneself from the liturgical context those voids become difficult to fill and you can be sure they are noticed! In front of our liturgy of many centuries we should contemplate it and venerate it and remember that in our mania for “improvements”, we only risk doing great damage. This means that the Gregorian chant is modal, not tonal and not rhythmical, it has nothing to do with “one, two, three, one, two, three”. We should not despise the way people sung in our cathedrals and replace it with a pseudo-monastic and affected murmuring. A song from the Middle Ages is not interpreted with theories of today, but one should go about it as it was then. Moreover the Gregorian chant of another historical time could also be sung by the people, sung using the force with which our people expressed their faith. Solesmes never understood this, but we should recognize the learned and large philological work executed on the old manuscripts. Next Sunday August 23rd after Mass there will be a pitch-in dinner hosted by the Brian Poe family at their home. All are welcome! The main dish and table service will be provided. Sides and dessert contributions are welcome. Please RSVP via e-mail to Susan Poe. Our friends at Rinascimento Sacro inform us that the Pontifical Commission “Ecclesia Dei” has made public its own guide for the celebration of the Mass in the “Extraordinary Form” of the Roman Rite, according to the motu proprio Summorum Pontificum. The guide is a 2-DVD production, with subtitles in English, French, Italian, and Spanish. The first DVD includes a full Missa Recitata, and some video excerpts of Missae Cantatae. The second DVD includes a proper teaching video, with explanations for the gestures and rubrics of the Mass, from the preparatio ad Missam to the post-Mass sacristy prayers. Other means of distribution will be available shortly. VATICAN CITY (CNS) — Pope Benedict XVI confirmed his intention to visit the Shroud of Turin when it goes on public display in Turin’s cathedral April 10-May 23, 2010. Castex’s recent discovery of the word “found” with another word next to it, which still has to be deciphered, “together may mean ‘because found’ or ‘we found,'” she said.